You may have thought that I’d completely forgotten about this contest. I published that post back in May about the photo contest I’d entered for the Corolla Wild Horse Fund 2015 calendar. You may also recall my contest, offering a not-yet-revealed prize for the reader who thought “In The Wind” (as I titled that picture) might be the photo the judges chose. An 8 x 10 canvas print of the winning photo. My blogging friend, Cindy, at Mama’s Empty Nest. I hope you like the canvas, Cindy, and thanks for being such a faithful reader! And thank you to everyone who participated in the contest. 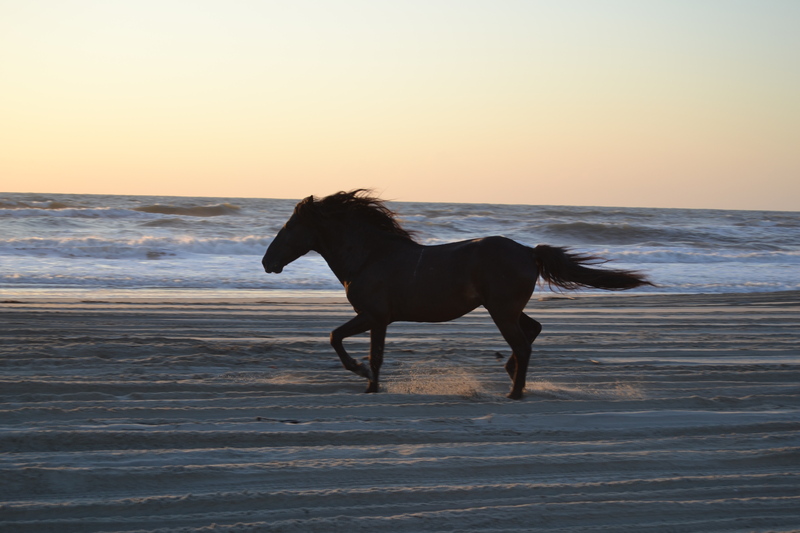 This entry was posted in OBX Wild Horses and tagged corolla wild horse, mamas empty nest. Bookmark the permalink. What a wonderful prize! Somehow I missed your contest completely!! Where was my head?!! But it’s great that one of your pictures was chosen. But all of your pictures of the horses are wonderful and you could make up your own calendar!! Congratulations to Cindy! Such a beautiful picture and a wonderful prize!! Perfect! 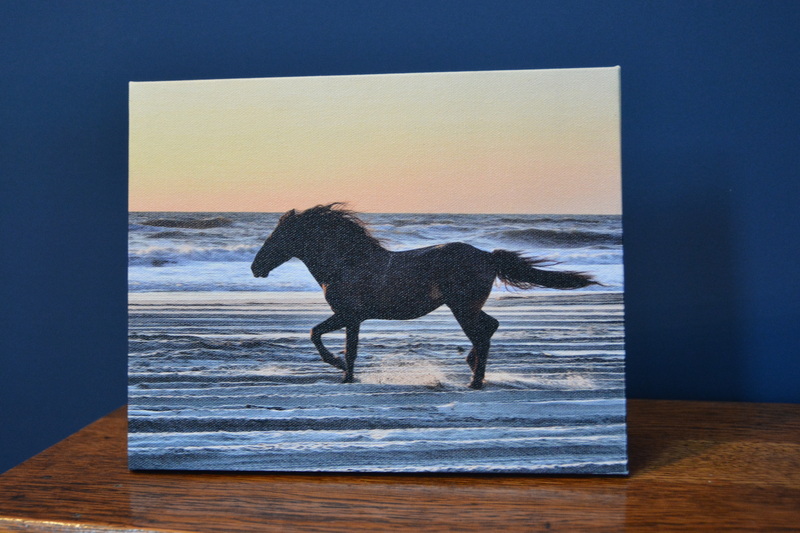 Congratulations to the winner……that’s a beautiful canvas print of your VERY gorgeous photo Dianna! That is a beautiful picture! Congrats to the winner and know that the lovely canvas will have a special place to be displayed. Congrats to you for your picture being selected and used in a calendar! What a Happy New Year way of ending ’13 and entering ’14…a calendar contest! Congratulations to you and congratulations to Cindy who will receive such a lovely print! What an honor to have your photo chosen! So proud of you that your work is being deservedly recognized. what exciting news and a beautiful picture, congrats!! i hope 2014 is a great one, for you and your family!! congratulations to you and to cindy, too! awesome! 🙂 Send me an e-mail with your mailing address, and I’ll send it right out to you! Wow, congratulations to BOTH of you! How wonderful for you Diane to have your awesome photography displayed in thousands of calendars and to Cindy who gets to display it every Year, Month and Day! Awesome! Lucky winner of such a great picture! Congrats to you Diana for your selection to be in the calendar! It’s always a thrill to have your photos enjoyed and appreciated. Winners everywhere here at TheseDays! A great photo, great honor, and a great contest ! Such a great Photo and such a great prize for Cindy!!! Congratulations to all! I’m thrilled to see your fabulous photography getting the recognition it deserves. Now I’m looking forward to your 2014 pics. Congrats for your selection in the calendar, and to Cindy for winning the canvas–Beautiful! Congratulations Dianna – and to you too Cindy! It’s no wonder that photo wins – it’s fabulous. How in the world did I miss this??? CONGRATULATIONS! Love the photo, and I’m so mad at myself for missing the giveaway 😦 If you decide to sell any…let me know!! !